July 31st is the last date for filing the Income tax return, when I requested my CA friend to file my tax return, in turn I received a request from him prepare a worksheet to prepare and maintain his billings. Based on his request I prepared the worksheet and I am sharing the same with you with brief note on how to use this. This is a simple and free to use utility, you can make necessary changes as per your requirements. Update the firm Profile which is to be printed on the bill. This is linked to the bill and the information will appear on the bill automatically. Create customer or client master to whom you want to make the invoice. In this you can create up to 100 customer details. This is one time activity, whenever you have to make the invoice to new customer you can create a record. Customer code will be generated automatically, which can be selected at the time of entering the billing details. After updating Firm profile and Customer Master, you can prepare the bill. To prepare the bill update the details in in BILLING DETAILS sheet. Customer code can be selected from the drop down list and other information is to updated to prepare the bill. This sheet also includes the collection details, updating the collection details will help in getting correct debtors statement. 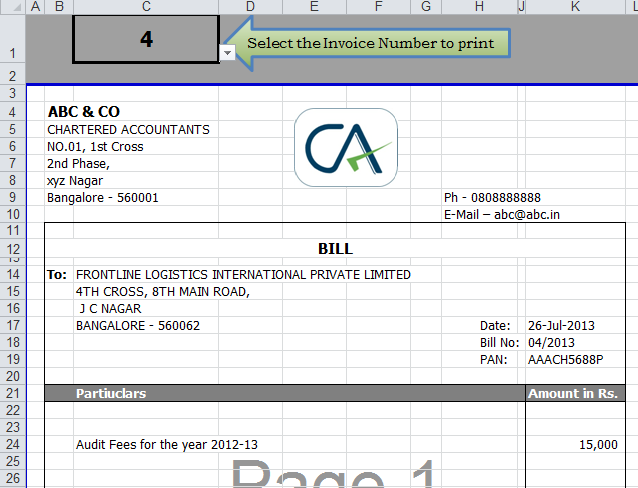 To get the print of the bill, go to bill print sheet and select the invoice number to be printed. Based on the invoice number the information will be updated in the bill and invoice will be ready for print. The collection status are to be updated in the BILLING DETAILS sheet. Based on this information the debtors statement with aging will be generated in the Debtors Aging Statement sheet. This file is not password protected, you can make necessary changes to the sheet and use this. Request you to give your valuable suggestions. The problem is what if i want to make an invoice with 2 different Services i.e. I am not able to download Billing and debtors management utility for CA’s.Kindly Send me the same on my email id.